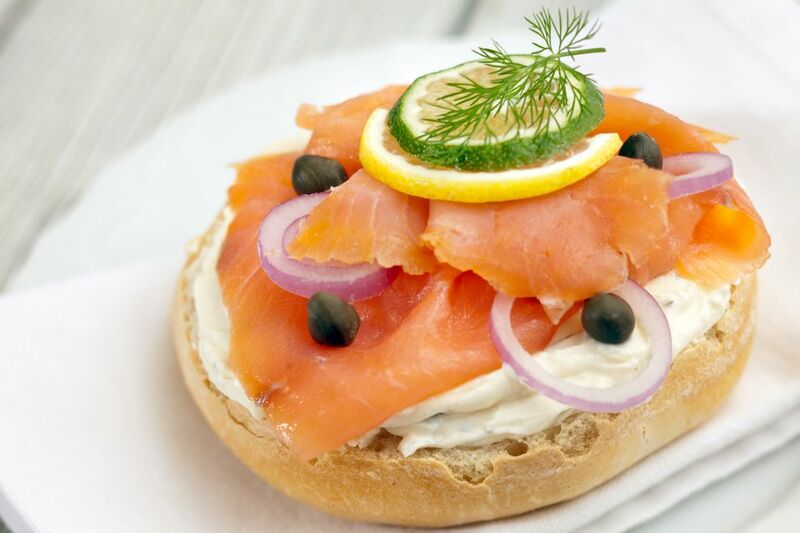 From Yom Kippur breakfast, or bris and baby naming celebrations, to wedding showers and Sunday brunches, there's a reason a bagel and lox spread is the go-to for countless hosts: it's comforting, crowd-pleasing fare, it satisfies cravings for a little salt, a little sweet, and it's easy to prepare. Whether you're feeding 5 people or 50, read on for a great do-ahead menu, shopping tips, and all-important information on calculating how much food you'll need to feed your hungry guests. 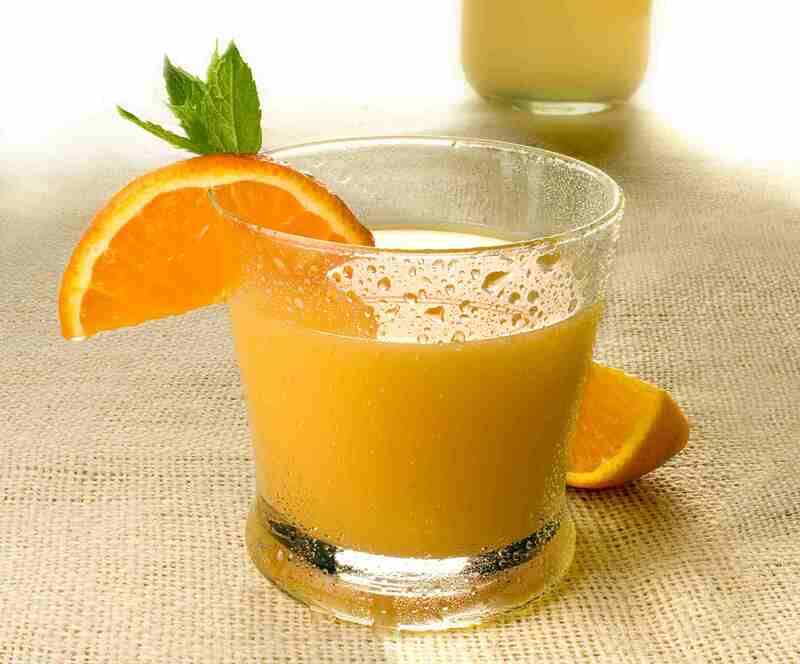 Set out juice glasses and a pitcher of cold mango nectar or orange juice, so your guests can enjoy a little pick-me-up as soon as they arrive. Keep the glasses small -- you want to perk up your guests, not fill them up. Crunchy on the outside, chewy and dense on the inside, fresh bagels are the ultimate foil for silky, salty lox, cream cheese, and veggies. If you've got a good local bagel shop, make a special trip for your break-fast bagels—they'll be far tastier and more satisfying than the commercial brands. If you're feeling ambitious, you can try your hand at making your homemade bagels. How much to buy: Many bagel shops allow 1 1/2 bagels per person when they're making catering platters, so that's a good rule of thumb to follow. Need a lactose-free option? Many bagel shops offer tofu-based cream cheeses, and Tofutti's Better Than Cream Cheese is widely available at most supermarkets. How much to buy: Get 1 to 1 1/4 pounds of cream cheese per dozen bagels. Offer a selection; plain, veggie, and scallion are popular flavors. Preferences vary for a block versus whipped cream cheese, so consider buying some of each. Lox, Nova, Belly....no matter which you prefer (or what you call it), any smoked salmon you serve is going to disappear, and fast. Connoisseurs may prize it hand-sliced paper-thin, but I've never seen anyone balk at less-than-translucent slices. If you don't have a great bagel or appetizing shop (or you need a large quantity at affordable prices), Costco and BJ's often sell kosher-certified sides of smoked salmon. For smaller quantities, Whole Foods tends to be a good source. Capers and lemon slices are nice accouterments. How much to buy: Allow an absolute minimum of 4 ounces (1/4 pound) per person, but keep in mind that lox lovers will happily devour more, especially after a 25-hour fast. 6 ounces per person wouldn't be unreasonable, and if you can afford it, you might even want to get extra. You can always freeze the leftovers—if there are any. While salmon may win the smoked fish popularity contest, whitefish has plenty of devotees. A whole smoked whitefish makes an attractive centerpiece, while whitefish salad is a well-loved—and affordable—alternative. How much to buy: 2 to 3 ounces per person if you're serving a whole smoked whitefish​ or 3 to 4 ounces per person for whitefish salad. Offer a platter of sliced raw veggies so everyone can customize their sandwiches. Cut the tomatoes thick, the onions thin, add some cucumber rounds and pepper rings, and your bases should be covered! How much to buy: For every dozen bagels figure 2 large tomatoes, 1 large onion, 1 large cucumber, and 2 bell peppers. Hydrating and refreshing, the melon is a great counterpoint to salty smoked fish. If you prefer more variety, then a fruit platter or fruit salad is a colorful, delicious cap to the meal. Emphasize juicy fruits, such as mango, pineapple, grapes, and berries. How much to buy: A large watermelon will serve at least 10 to 12. Smaller varieties, such as sugar baby melons, will serve 4 to 6. For fruit salad, you'll need about 3 1/2 to 4 pounds of fruit for every 10 guests. If you'd like to serve more than just fruit for dessert, but don't want to bake, sorbet or granita is a nice option. Serve it solo, or with purchased cookies alongside it. How much to buy: A pint of sorbet serves 4, a quart serves 8. Add lemons, limes or cucumber to large pitchers of cool water to add flavor and a classy touch; seltzer or unsweetened, decaffeinated iced tea are great options, too. Offer a selection of teas, along with regular and decaf coffee. Don't forget to offer sugar, honey, and milk or cream. How much to buy: Thirsty guests are likely to pour large drinks, so set our at least 2 large (80 to 90-ounce) water pitchers per 10 guests, and be prepared to refill! Each liter of seltzer serves 4 to 6; if you have a Sodastream, you may want to keep a pitcher of cold water in the fridge so you can refill the bottles and fizz away! For a small group, brewing up a pot or two of coffee will generally suffice; if you're expecting a lot of guests, you may want to the coffee urn route. For tea, a vacuum press pot or a second urn dedicated to hot water only is a good option.